Columbus Mayor Andrew J. Ginther looks on as resident James Rogers expresses thanks for renovations that included an elevator at a 3-story Homeport senior apartment building on North High Street. The ribbon cutting ceremony was a celebration of improvements of three sites comprising Victorian Heritage. At the recent celebration of Homeport property renovations, one of our senior residents marvelously expressed her fortune at remaining in her affordable and now modernized apartment. “A lot of us, we get just Social Security. We don’t have enough money to live anywhere else,” Linda Bettac told Ch. 4 news reporter Elyse Chengery. In meetings throughout Central Ohio, I consistently communicate one message about Homeport: we are a people business that uses real estate as its platform. 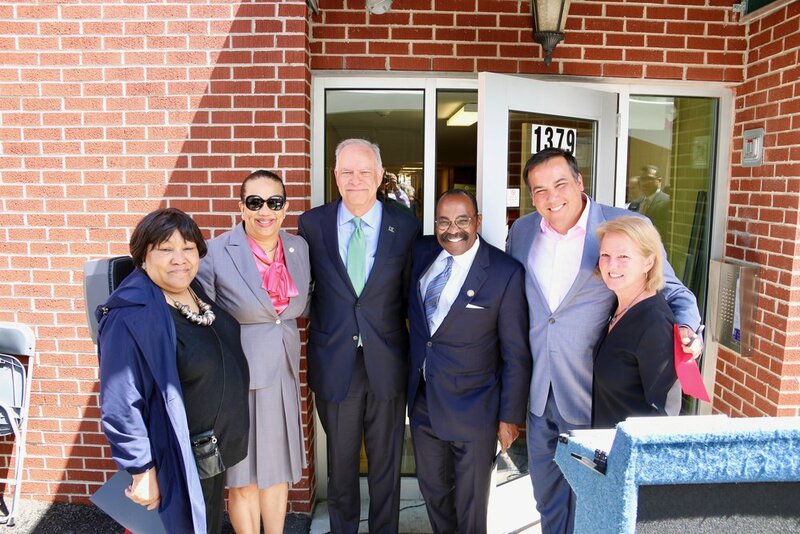 So it was exceptionally pleasing to celebrate completion of Victorian Heritage, a three-site, 59-apartment, $10.3 million renovation of affordable housing and historic preservation that keeps families and seniors of moderate income in place, ensuring their security, opportunity and dignity. At the intersection of Clark Place and Dennison Avenue in the Short North, we have renovated a pair of historic, two-story, 116-year-old brick buildings. The buildings have new roofs, freshly painted walls and modern amenities built to green standards. Inside these eight apartment homes are residents like Marquisa, a single Mom, who, thanks to Homeport, has kept her high school age son Donovan amongst friends he has made over a decade while he finishes his education at Fort Hayes Arts & Academic High School. Nearby at the southern border of Weinland Park, Homeport completely renovated and upgraded 17 two-story, two-bedroom townhome apartments at Fifth Avenue and Hamlet Street. The buildings – originally constructed in 1909 – now support the dreams of individuals like Keyonna, a working single mom with twin boys, 15-months old. Then there is the three-story building at 1379 N. High Street, 34-apartments built in 1951. Seniors 62 and older, were re-located for eight months while improvements were made for the long term. When the residents returned to their home in the University District, they found newly renovated homes and one very significant addition -- an elevator. For upper floor residents like James Rogers, the elevator was, in his own words, a “godsend.” And for good reason. A retired chef, Mr. Rogers had both knees replaced after standing up a lifetime to make a living. We purchased the Victorian Heritage properties in 2014 to keep individuals in neighborhoods once downtrodden but now in demand. Our success – with the support of housing organizations, funders and elected officials from Ohio to Washington -- represents what we can and hope our community can be: caring and inclusionary. Which brings me back to the powerful words of Linda Bettac, our North High Street senior resident who grew up not far from where she lives. Bruce Luecke is President & CEO of Homeport. Watch photo gallery of Victorian Heritage ribbon cutting program featuring elected officials, funding partners, Homeport employees and Victorian Heritage residents.